Confederate forces led by J.E.B. Stuart were able to delay Union forces at The Battle of Boonsboro, allowing more time for the Army of Virginia to escape. The withdrawal soon came to a halt when heavy rains swelled the Potomac River, preventing the Confederate army from crossing back into Virginia. Forced to wait until the river receded, Lee established a long, semi-circular defensive line anchored on his left by the Conococheague Creek and on his right by the Potomac River at Falling Waters. On July 6, 1863, Union Brigadier General John Buford launched an ill-fated cavalry assault against Imboden at Williamsport. The Confederate general summoned enough artillery and defenders to hold off a three-hour Federal onslaught, saving the Rebel stores and wounded from being captured. On the same day, Brigadier General Judson Kilpatrick’s Union cavalry division tried unsuccessfully for six hours to dislodge Major General J.E.B. Stuart’s cavalry from Hagerstown, about eight miles east of Williamsport. Following the failed Union assaults on July 6, the Federal cavalry fell back to Boonsboro, along the National Road roughly twelve miles southeast of Hagerstown and Williamsport. When Lee arrived at Williamsport on July 7, the river remained too high to cross, so he went to work bolstering the Confederate defensive line as the remainder of his army moved southwest to join him. Lee also ordered Stuart’s cavalry to advance upon the Union cavalry at Boonsboro to prevent the Yankees from gaining control of the South Mountain passes, hindering Meade’s access to the Confederate army stranded at Williamsport. On July 8, 1863, Stuart advanced toward Boonsboro with four cavalry brigades. 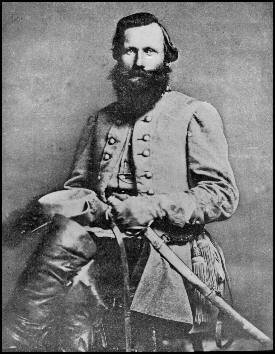 The action began when Brigadier General William E. “Grumble” Jones’s brigade encountered Federal pickets near Beaver Creek about 4.5 miles north of Boonsboro. As the Confederates pushed forward they met the Kilpatrick and Buford’s combined Union forces at about 11 a.m. on rain-soaked, muddy fields outside of town. Sloppy conditions forced the troopers on both sides to dismount and fight like infantrymen. The battle, which was the largest cavalry conflict in Maryland during the Gettysburg Campaign, raged throughout the afternoon. At roughly 7 p.m. Federal infantry began arriving on the scene, forcing Stuart to withdraw north to Funkstown. Although results of the battle were inconclusive, Stuart successfully delayed Meade’s movement toward Williamsport, buying more time for Lee’s retreat to Virginia. Combined casualties at the Battle of Boonsboro totaled about 100.